Some data updated through September 2. Sunday, July 29th, marked the point when there are just 100 days left until the November midterm. In this post I will try to pull together my various writings and predictions for both the 2018 House and Senate elections. I begin with the most important factor that influences both types of races, the President’s job-approval figures. The President’s job-approval rating is an important predictor of midterm election results in both my model for Senate elections and the one for House elections. The Democratic advantage on the “generic-ballot” question about voting in House elections has waxed and waned as Donald Trump’s approval rating first fell after he was inaugurated then rose again over the past few months. 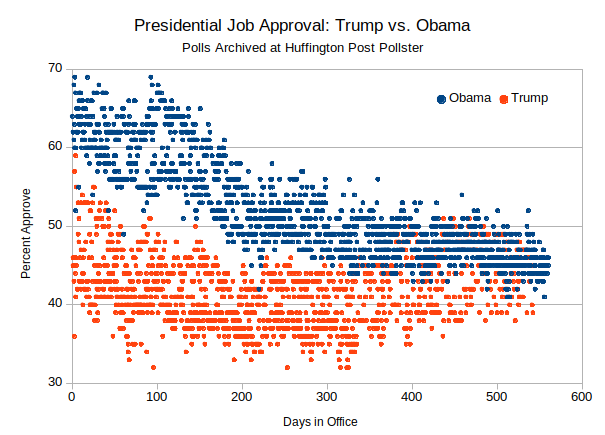 Donald Trump enters the 2018 election with about the same level of public support Barack Obama had in 2010. Though Obama was much more popular when he was inaugurated, that goodwill faded over the following eighteen months. In the 2010 midterm that followed, the Democrats were “shellacked,” losing sixty-three seats in the House of Representatives. Support for Trump also ebbed away during 2017, but he has rebounded slightly from his nadir last December. 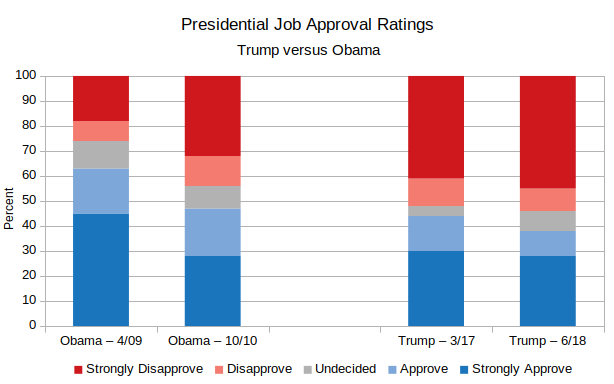 Though Trump’s overall approval rating heading into the first midterm is largely identical to Obama’s, Trump is more intensely disliked. Pew reported that the proportion of people saying they “strongly” disapproved of Obama’s performance in office grew from 18 percent in April, 2009, to 32 percent by September, 2010. For Trump, CNN found that he took office with over forty percent of Americans already strongly disapproving, a figure that has remained relatively unchanged. In its June, 2018, poll CNN reports a “strongly disapprove” figure of 45 percent. 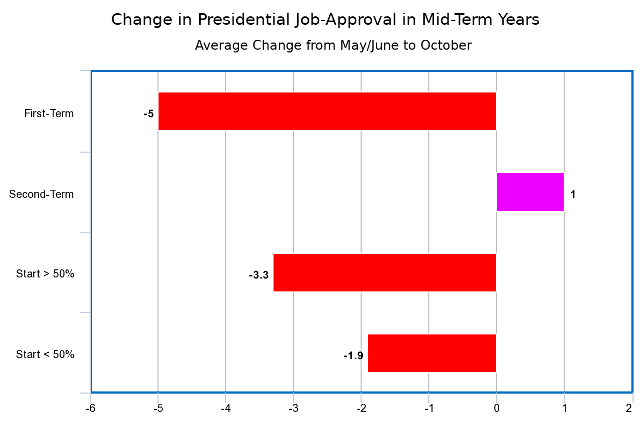 As the first chart shows, the president’s job-approval rating bears directly on the “generic-ballot” question. 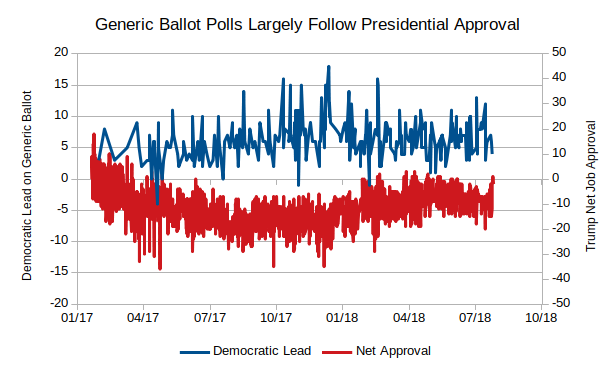 Based on polls through September 2nd, the Democrats’ lead on the generic ballot has grown slowly since Inauguration Day and inversely with Presidential job approval. The grey area in the chart below represents the likely range of outcomes. Since April, Donald Trump’s net approval rating has ranged from about -8 to -14. Those values define the left and right sides of the shaded region. When I include estimates of any methodological or unique “house effects,” I find that polls conducted over the Internet show a pro-Republican tilt of about 2.6 percent. Gallup’s polling shows an ever greater Republican edge of nearly five percentage points. I use the values for live polling, which are most favorable to Democrats, and those from the much-less favorable Gallup, to define the height of the grey area. 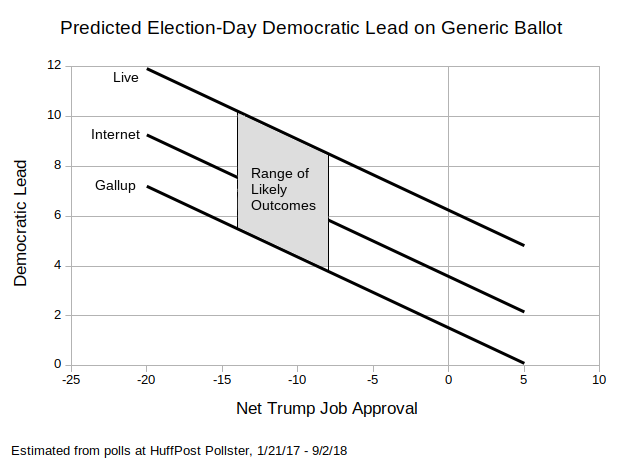 Notice that, according to these results, even if Trump were to achieve a net approval rating of zero, Democrats are still predicted in live polling to lead on the generic ballot by about six points on Election Day. That reflects the slow growth in support for Democratic House candidates over Trump’s presidency from about four points on Inauguration Day to a predicted six points this November. In past elections the margin of victory in generic-ballot polls has proven to be a pretty accurate predictor of the actual division of the vote. An earlier version of this model showed a small, marginally significant positive boost for Democrats in polls of likely voters. That difference has disappeared as the number of polls has increased. Since Democrats are generally disfavored in likely-voter polls, especially ones conducted in midterm years, a finding of no difference between registered and likely voters is actually positive news for Democrats. One other major problem for House Republicans has been the historically large number of their Members who are leaving, or have left, the House. Forty Republicans will not be returning to the House next January creating an excess number of more vulnerable open seats on that side of the aisle. Only 18 Democrats are leaving the chamber. With 22 more retirements than the opposition, the largest midterm gap since the New Deal, the Republicans face a loss of 39 seats based on the historical relationship between the two measures. There is no national generic-ballot question for Senate elections because only two-thirds of the states have a Senate race in any given year. 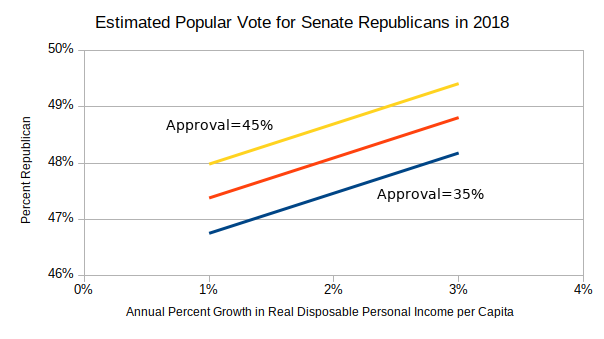 Looking back historically over Senate elections, the fate of the President’s party depends directly on his job-approval rating and, unlike for House elections, the state of the economy as measured by the growth in real disposable personal income per capita. Any plausible combination of approval for Donald Trump and income growth predicts that the Republicans will fail to win a majority of the popular vote for Senate in November. One reason is that the popular vote for Senate candidates of the President’s party runs four points lower when the President is not on the ballot. Much has been made of the 4.1 percent increase in Gross Domestic Product reported for the second quarter of the year. That figure represents the growth in nominal GDP; after adjusting for inflation the figure is 2.8 percent. Unfortunately for the Republicans little of that growth appears to be “trickling down” to ordinary Americans. Here are the recent trajectories for both real GDP and real per-capita disposable personal income. Personal income has hovered around a two-percent growth rate for the last three quarters, while real GDP grew more quickly. If voters respond to changes in the amount of money in their pockets, then the economy will not be sufficient to power the Republicans to victory in the fall. From the chart above, a two-percent growth rate in per-capita income and even a 45 percent approval rating for Donald Trump still leaves Republican candidates short of a majority in the national popular vote for Senate. Americans became much more cognizant of the word “gerrymander” after the redistricting that followed the publication of the 2010 Census. Drawing lines for partisan advantage has become easier as voters have segregated themselves geographically by party. Together the two forces have combined to create a Republican “bulwark” in the House. Democrats need to win the popular vote by more than fifty percent to take half the seats in the body. How much more is subject to debate, but most estimates put the needed margin of victory in the range of six-to-eight percentage points, or an election where the Democrats win somewhere between 53 and 54 percent of the popular vote. For instance, The Economist currently projects the Democrats to win 54.3 percent of the popular vote, or a margin of 8.6 percent, but take just 51.3 percent of the seats in the House. Both Dave Wasserman at the Cook Political Report and Nate Cohn at the New York Times cite a seven-point margin as the minimum required for a slim Democratic win. My model agrees. It uses historical voting data back to 1940 to estimate the relationship between seats and votes. I include adjustments for redistricting after each Census and for the decline in political competition since the 1994 “Contract with America” midterm. 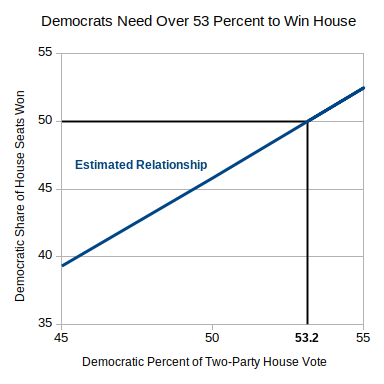 Using those data I estimate the Democrats need at least 53 percent of the national popular two-party vote to win a majority in the House of Representatives. Unlike House districts, Senate seats cannot be gerrymandered because they constitute entire states. That makes the Senate more competitive than the House. There is no equivalent “bulwark” in the Senate; winning half the popular vote generally translates into about half the seats. 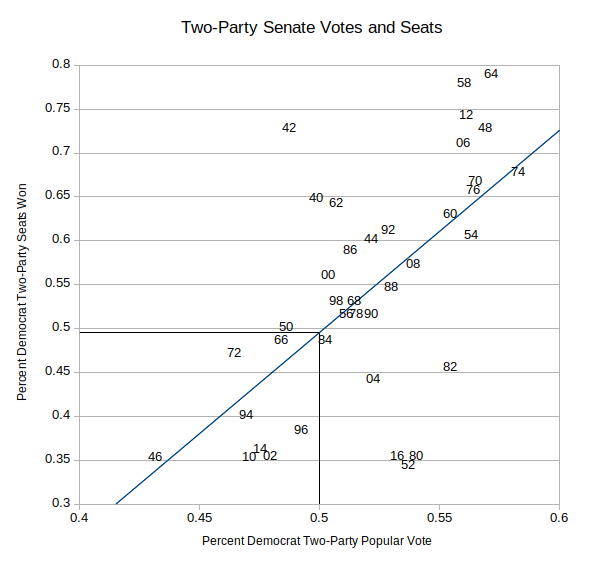 Since the model predicts that the Democrats will win a majority of the 2018 popular vote for Senate, we should expect the Democrats to win a majority of the 35 Senate seats at risk. Winning 18 of those seats would not be enough to flip control of the Senate because of the Vice President’s tie-breaking vote. Nineteen seats would give the Democrats control. Can the Republicans rebound between now and election day? Unfortunately, recent history suggests they will face even larger obstacles in November than they do today. Presidential approval generally declines as the election nears, and the opposition party’s advantage on the generic ballot grows. Job approval for first-term presidents fell on average about five points between May/June and October of midterm election years. Trump might see a smaller decay because his current popularity is historically low, around 42 percent. Presidents whose approval was above fifty percent in May/June saw a 3.3 percent drop in approval; those who started below fifty percent in May/June saw their ratings fall an average of just 1.9 percent. 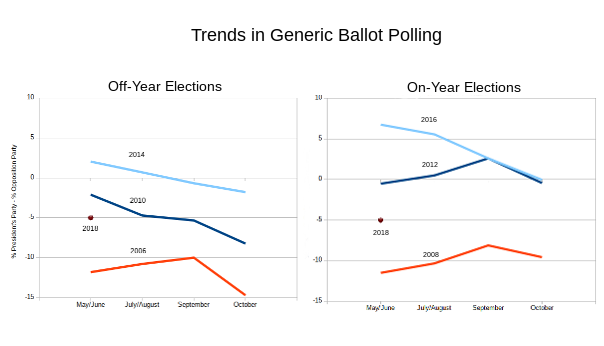 In off-year elections, generic ballot polls for both of Obama’s midterms fell as the election neared. For George W. Bush in 2006, Republicans recovered slightly from their early summer deficit, then watched support for their candidates crater in October. Most observers credit that sharp decline to the Mark Foley scandal that fall.